The West Bengal Health Recruitment Board, Has Recently Published A Recruitment Notification For The Post Mention Above, So Eligible And Interested Indian Can Apply For This Job From 12th Of February To 19Th Of February, 2019. Kindly Do Check Out The Official Notification For Accurate Information, It's Mention Or The Link Of The Notification Is Given Below. A. 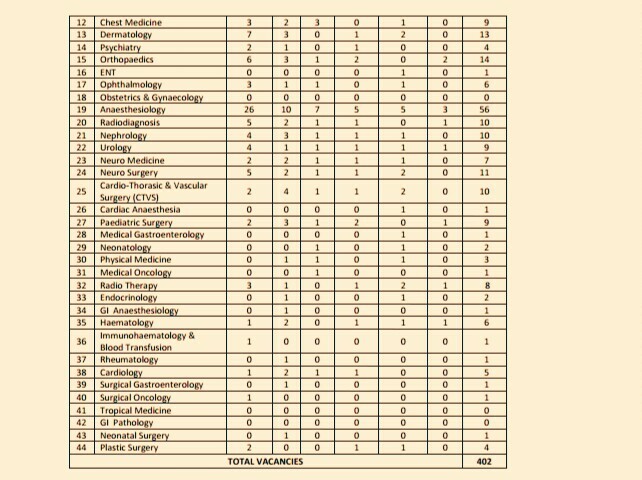 Number Of Vacancies & Name Of The Posts (Advertisement No. : R/T/D(MES)63(01)/2019). Tutor/Demonstrator (44 Anticipated Posts Under This Notification) →402 Vacancies. 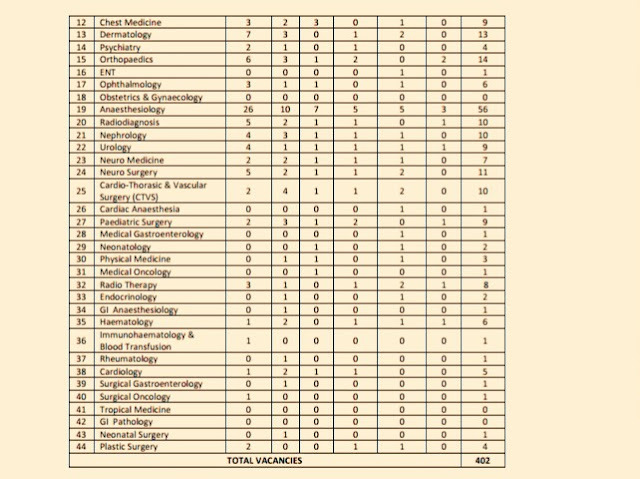 Total Number Of Vacancies →402 WBHRB Vacancies 2019, Kindly Do Check Out The Image's Below For Detailed Posts. (Credit - Official Notification Of WBHRB - Advertisement No. : R/T/D(MES)63(01)/2019). B. Eligible Criteria For This Job Of West Bengal Health Recruitment Board Recruitment Notification 2019. Age Limit →Should Not Exceed The Age Of 45 Years, As On 1st Of January, 2019. Educational Qualifications →i) Essential : MBBS Degree from an MCI recognized University in accordance with the regulations made by the Medical Council of India and included in the First or Second or Third Schedule of the Indian Medical Council Act,1956(102 of 1956) with Permanent Registration No. from WBMC/MCI ii) Weightage shall be given to candidates holding recognized Postgraduate degree( for disciplines under the Specialities group) and recognized Post Doctoral degree( for disciplines under the Superspecialities group) in the concerned discipline in accordance with the “Minimum Qualifications for Teachers in Medical Institutions Regulations,1998”framed by the Medical Council of India, published in Part-III, Section-4 of the Gazette of India,dated the 5th day of December,1998, as subsequently amended, and which are included in the First , Second or Third Schedule of the Indian Medical Council Act,1956(102 of 1956). Mode Of Examination/Selection Process →Selection Will Be Conducted By WBHRB. Online Application/Examination Fee →Candidates must submit online the application fee amounting to Rs. 210/- (Rupees two hundred ten) only through GRPS ( Govt. Receipt Portal System ), Govt. of West Bengal under the Head of Account ‘0051-00-104- 002-16’, No Fee For Other Reserved Candidates. Last Date For Online Application Form Submission →19Th Of February, 2019. For More Info →Do Check Out The Official Website Time To Time For The Information Related To WBHRB Admit Card Download, Exam Result And More, Link Is Here>The Official Website Of West Bengal Health Recruitment Board. Kindly Do Check Out This Website For More Job In West Bengal & All Over India, Till Then Stay Safe And Blessed.